August 15th is here once again, it’s been two years since we lost Dom to cancer. It still hurts. A lot. I know that I am not the only one who has lost a friend or family member to disease, illness or accident. Sadly, most everyone that I know can share a story or two about someone they cared deeply about who passed away before their time. I’m long past feeling sorry for myself, wondering what the meaning to it all is, what I am supposed to learn from the journey, from the experience. After two years of thinking about Dom and all of the twists and turns that his treatment, surgery and recovery took on the way to August 15, 2010 I’ve come to realize that there really aren’t any good answers. Bottom line is that there are two beautiful, funny, smart little children growing up in Dormont, PA without their father. There is a wonderful young woman who misses her husband, and an amazing family in Hopewell, PA – a Mother, Father, Brother’s, Aunts, Uncles, Sister-In Laws, Cousins, Nieces and Nephews who miss Dom terribly. He was everybody’s favorite. No matter who you were, young or old, a relative, close friend or somebody who got introduced to Dom with a beer in one hand and a brat in the other at a Pittsburgh Steelers playoff game like I did … you automatically loved that guy. I’m not ready to let go yet. 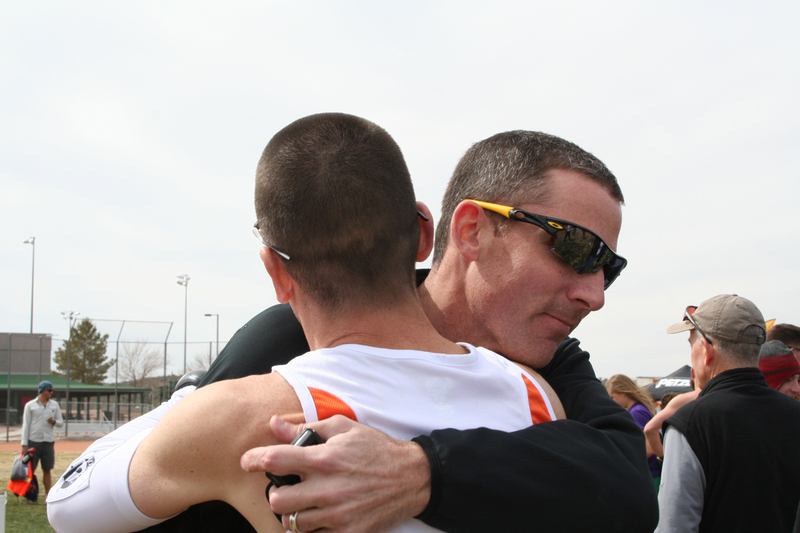 I still race with his initials on my shoes and his voice in my head when times get the toughest. If you are really “racing” an event – and not just running in a race – there are large differences between the two, every athlete reaches a point where things seem like they are starting to fall apart. In a short event like a 5K or 10K it becomes about pain management. You physically can keep running at that pace. It is physiologically possible – you just have to shut down your pain-sensors and keep pushing. Don’t give in. Hang on until you reach the final mile. At that point I know that I’m going to make it. In the longer races like the marathon or next month’s Ironman 70.3 it is not the same feeling as a short distance event. It’s not pain management as much as fighting the changes that your body is going through related to fuel and endurance. It is what I refer to as “the dark place” where you have to be mentally strong – continue to fight – don’t give in to your body’s desire to slow down and conserve energy. That is the battle at play. Your fuel is running out and your body is automatically sending you signals as to how fast you can continue to go on your remaining glycogen stores and fat. It wants you to slow down. You want to stay the same. The battle is internal and it is a dark, dark place. Until that final mile. It is those moments when I turn to my source of strength. I think about seeing Dawn and Landry at the finish line. I imagine what having those little arms around my neck are going to feel like. What hearing Dawn’s voice in my ear will sound like – and I think about Dom. There are a lot of brave individuals who have battled cancer. I meet them all the time. My desk faces one of them at work every day. My Mother is another one. They are amazing to me. Inspirational. I don’t know of any who were braver than Dom. Talking to him throughout his battle was something I will never forget. I would be at home with ice on my right shin and a bag of frozen peas on my left instep nursing two nagging injuries that I was battling training to run two marathons in 13 days for Run for Dom – and Dawn would hand me the phone with Dom on the line. We would talk about his treatments, his surgery, how he was feeling and he would ask how my training was going. “Great” I would say. “We are going to kill it in Boston Dom.” I would tell him. All of a sudden my shin didn’t hurt so much and my left foot felt a whole lot better. There were some pretty tough moments racing Boston and Pittsburgh back to back like that. The thought of it today still makes me shake my head and wonder how in the hell I pulled that off – especially that second marathon less than two weeks after Boston. But I would sign on and do it again in a second if it would make a difference. That was what it was all about, helping provide support to Dom’s family and contribute to his children’s educations. We crushed our goal of raising $26.2K and kept on going almost $10,000 past that mark. 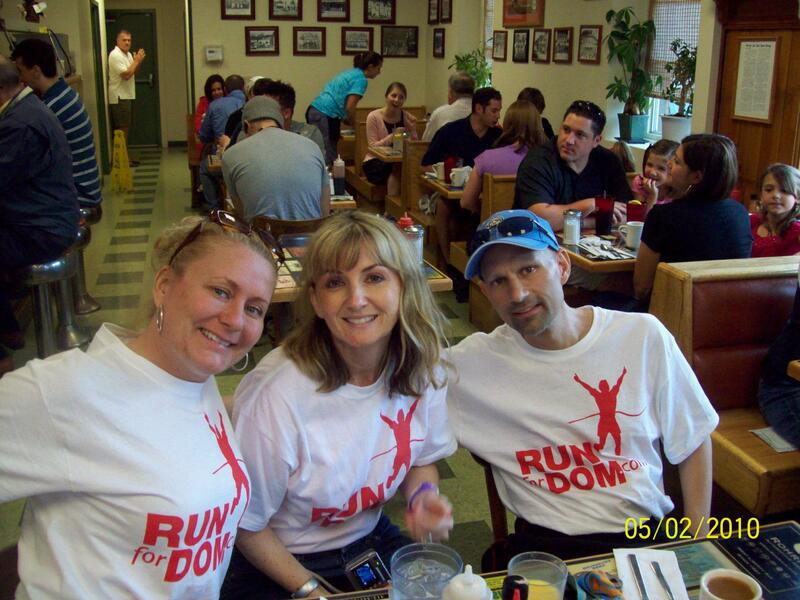 Dom< Val and Renee at the DorStop in Dormont, PA after the Pittsburgh Marathon in 2010. In the races since I’ve been running for me as much as Dom’s memory and we’ve had some pretty amazing experiences – a lot of them were made possible by Dom as he taught me just how tough I really am. How much I can endure and how much it takes to break me. Most of us go through our lives never knowing what those limitations are because we are scared to find out. Dom’s battle with cancer granted me the opportunity to put myself out on a limb and see just how close I could come to reaching those limits. I haven’t stopped reaching since over these last two years. I want to test myself. It makes me feel alive. So Dom, when we dip our toe in the water at next month’s Kerrville Half Ironman and I am staring a 1.2 mile open water swim in the face, a 56 mile hilly bike ride through the Texas Hill Country and a 13.1 mile run back through town to the finish line you are going to be there with me every stroke, pedal and step of the way. Just as you have been for the last 24 months. Today the training schedule called for a 10-mile training run. I ran an extra 2 for you this morning, one for each year you’ve been gone. They were the fastest miles of my workout. I can do anything for 2 miles. There are race reports and then there are race reports. They say that a picture paints a thousand words – and that may very well be the way to go on this one. How exactly do you capture what transpires over a race covering 200 miles through the Arizona Desert over 25 hours and 47 minutes? 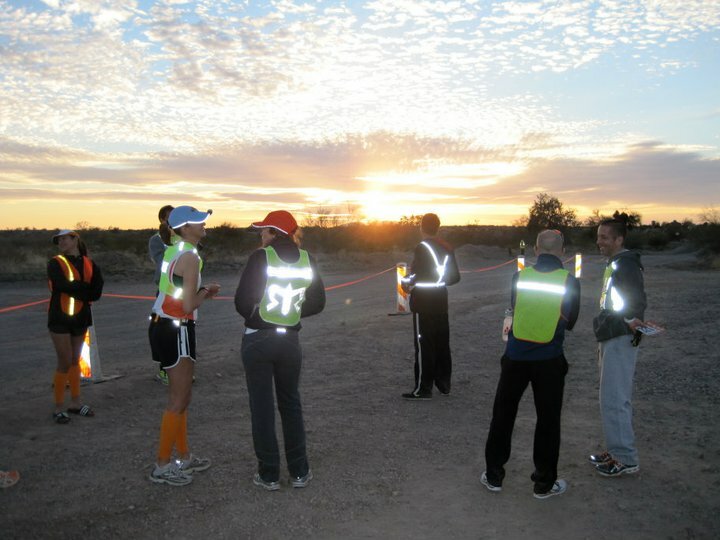 I could write for hours and hours and never fully capture what the Ragnar Del Sol Team Ultra-Marathon was “truly like”. Looking back at photos from the Friday to Saturday race, I see a lot of smiles, good friends helping and encouraging each other and celebrating finishing what was truly a grueling race. I see the van that I spent 25 hours living in with my teammates, running leg after leg of a race, hour after hour with very little in the way of real food, virtually no rest and absolutely no sleep. But when it was time to get back out there and “do my thing”, my legs somehow answered the bell every time I asked them to. It was a truly wonderful experience and one that I hope I get a chance to do again next year. 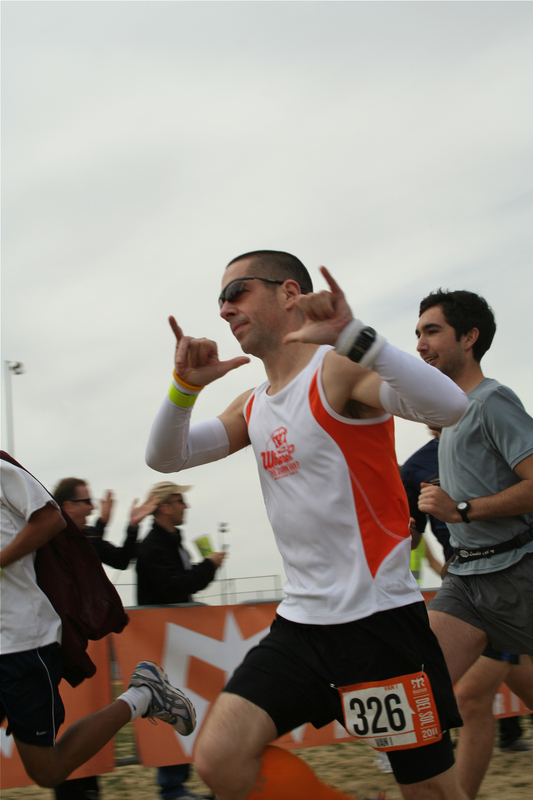 I remember after my first marathon that I thought that I might not ever run another one. That was how beat up and hurt I was after Philadelphia in 2006. I needed to rehab my IT Band injury, train much harder and smarter and returned to the marathon 18 months later. This being my first “ultra” experience, our team was talking about a return to another relay event while this race was still unfolding. That is how much fun we were having and how much we were enjoying the challenge. Not just through the 20-20 vision of post-race rose colored glasses. But we were actually talking about another race like this during the heat of the battle. That is how I knew that I was a part of something that was truly special as it was unfolding. Maybe we would run the next one from Miami to the Florida Keys or a race on the East Coast. Who really knows, but I won’t be forgetting this experience for a long, long time. Team members flew in to Arizona on Thursday from Baltimore, VA Beach, Austin, Houston, Dallas and Cincinnati to meet up with our teammates from the Phoenix/Scottsdale area. After settling in at our host family’s home – Kimberly and Michael Miller a few of us went for an easy run to loosen up a bit after traveling. I had not run since the Austin Marathon on Sunday, but I did ride 9 miles on Tuesday and 15 miles on Wednesday on the tri-bike to keep my legs moving a bit. I was not sure how my legs would respond only 4 days after the marathon, but the chance to run with my good friend Steve Speirs was too good to pass up. 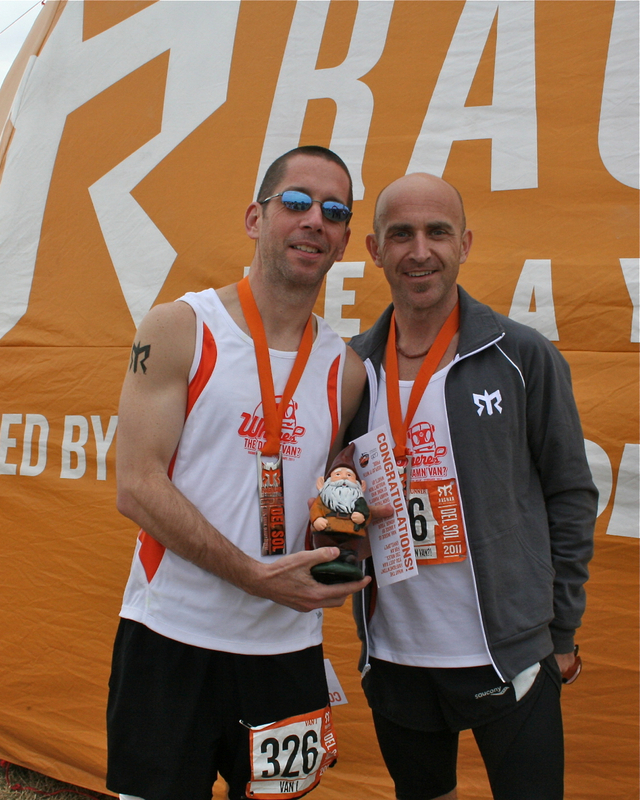 Steve has helped me so much this last year improve as a runner – it would be a great opportunity to turn in some easy miles and chat a bit in person. Thomas and Michael settled in behind us, Kimberly, Nina and Eddie in a group behind them. We ran a relaxed pace 7.8 miles through the desert area behind the Millers home. A great trail with some uphill and downhill stretches which allowed me to go easy through all of my “gears”. My legs actually felt refreshed and we clicked along around 8:20 min./mile pace. Friday night was spent with the team at the Millers who were gracious enough to feed and house the team. Pre-race dinner consisted of pasta, bread, salad and a few adult beverages to make sure our carbohydrate tank was full and it was time to get a little sleep. This would be the last bit of sleep I would get until Saturday night. Friday morning we packed up our belongings and got ready for the drive of about 1 ½ hours up to the start in Wickenburg, AZ. Before we got going we had to decorate the Van that we would be spending the next day and a half in. Team Where’s The Damn Van?! Actually consisted of two “Vans”. Half of our team was in van 1 (actually 7 runners) and the remaining teammates would race out of van 2. There were a total of 36 legs to be run from start to finish covering 200 miles of the race course. Being the 1st runner, I had the honor of running the first leg of the race out of the start area and then would hand off to the second runner on our team Jenny Jowdy. Jenny would run leg two, pass the slap-wrist baton to Steve Speirs and he would head out onto the course. Steve would pass to Kimberly, Kimberly to her husband Michael, Michael to Sean Brown and then Sean would pass to Thomas Neuberger. That would wrap up our Van’s legs and we would then drive on ahead and allow Van #2 to run their legs of the race. At the end of leg 12 it would be time for me to jump back in and lead our van back out through the same process. 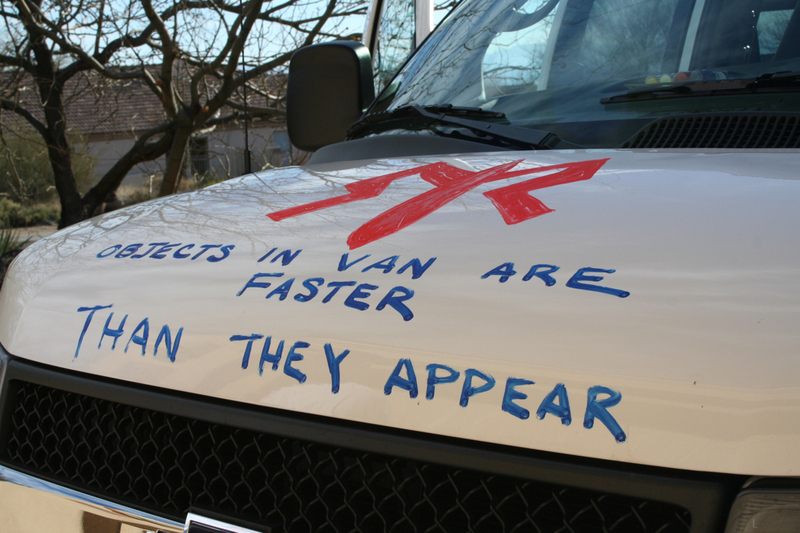 We would do this through three complete cycles – every runner on team Where’s the Dan Van?! Would run three times for a total of 36 legs covering the 200 mile course. Team "Where's The Damn Van?!" Being my first experience of a race of this kind, I really went into it not knowing at all what to expect. 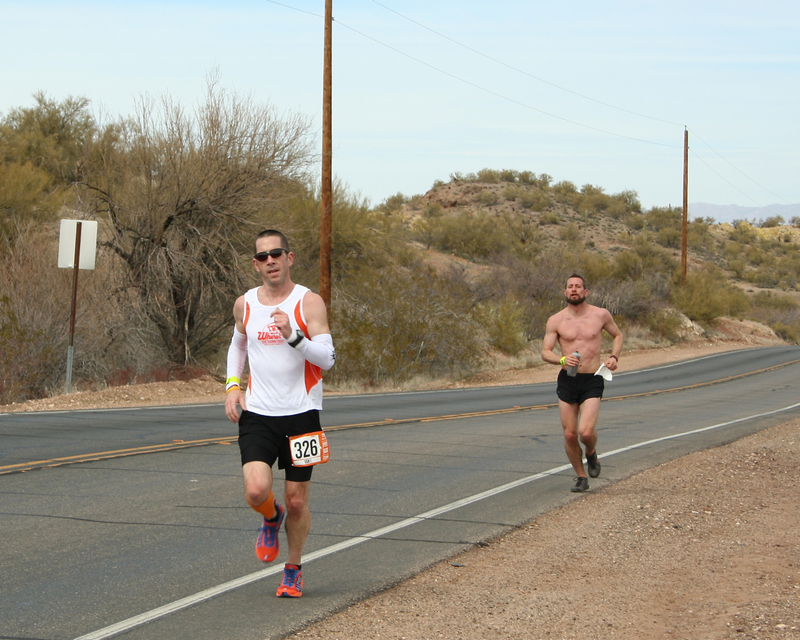 Running the event only 5 days after the Austin Marathon also had me a bit “anxious” regarding how I would hold up over 3 legs totaling about 19 miles through the mountainous desert of Arizona in the span of only 18 hours. We got the van decorated, loaded up and made our way to Wickenburg. Upon arriving on-site, my nervousness was quick to leave as I pinned our race team bib to my shorts and went for a short ½ mile warm-up. The rhythm of “race day” took over and I started to feel strong and powerful once again. 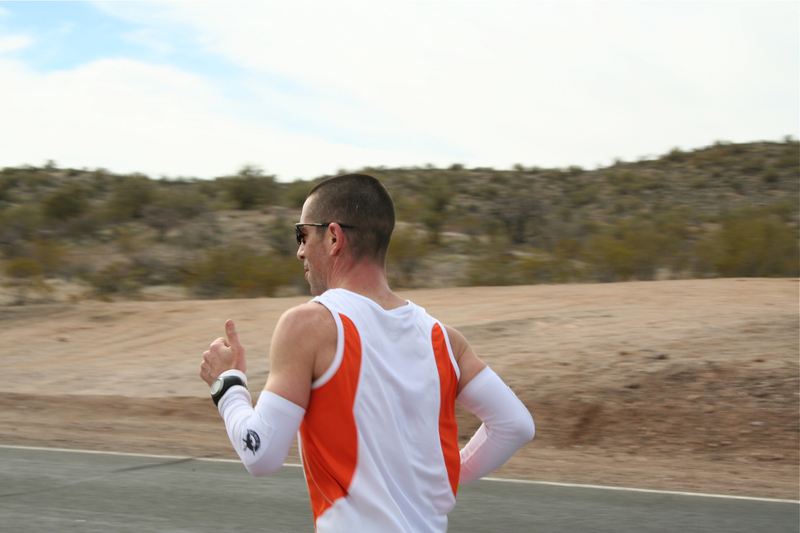 This was my first opportunity to log a little bit of time in our team “Singlet” and bright orange calf sleeves that were graciously donated to our team members from the folks at Zensah. You might recall my review of their compression sleeves from last year when I was coming back from my shin splint pain – found here. 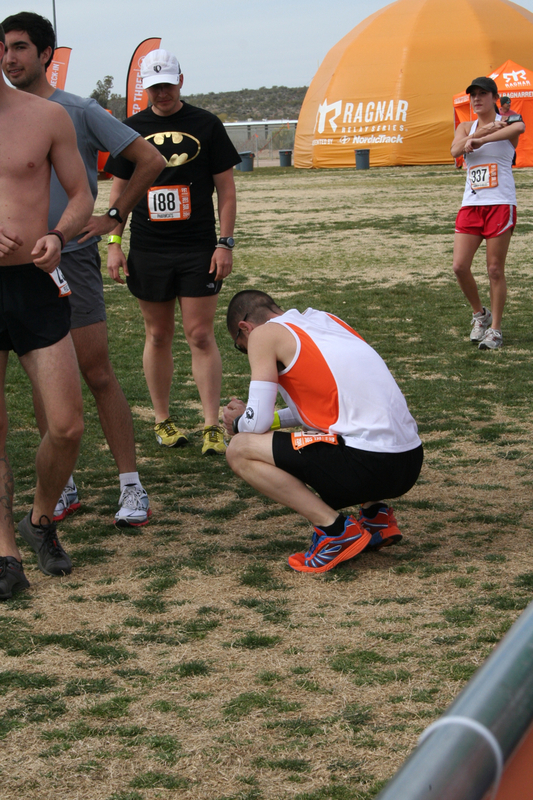 Once again, their product worked like a charm and kept my legs feeling fresh throughout the Ragnar Del Sol race. The optic orange color also played well through the desert as we were able to spot our teamates as they approached each exchange area. My first leg was 8.6 miles out of Wickenburg. 1.5 miles slightly downhill, then 7 miles of climbing up 574 feet. I like to climb on race day, I feel like it helps me gain an advantage over runners who may be a little bit “faster” than I am on the flats. Sure they might be able to run 6:30 pace on flat ground, but can they run 6:50 pace through the hills? As I entered the starting area I milled around a bit with the other runners and got to chatting with two in particular. One was very gracious and friendly, the other very standoffish and perhaps even a tad arrogant. Interesting I thought, but I did not pay much mind to him. He was quick to tell me that he planned on locking in at 6:30 pace throughout the leg. “Nothing too strenuous” as he put it. I thought that he was either an incredible runner or had not looked very closely at the course map. I filed that away for later and figured I would see him on the hills. Ever since the Pittsburgh Marathon in 2010 I’ve shared with you here that I’ve felt the need to crouch down out of the eye-line of the other runners to just “take a moment” to remember Dom. It helps settle me a bit and focus in on doing my very best, no matter what that means on that particular day. The shot below was taken just before the start of the race. At the horn we took off out of the starting area. Time to do this thing. I had thought about just cruising at 7:15 pace over the first leg, but after my discussion pre-race in the chute with our fellow competitor I wanted to stay in contact with him through the opening 1.5 miles. If I could hang in until the hills started I liked my chances of passing him by. You just ran a marathon 5 days ago. You have to run two more legs after this one in the next 18 hours. Mile 1: 6:23 – Not my smartest moment. I settled back down pretty quickly and turned in a second mile at 6:41 pace before the climb. Heading uphill I focused on staying smooth and consistent with my effort and started to reel in the runners ahead of me. At the mid-point of the climb heading to the top I saw “The Damn Van” parked on the right shoulder of the road and my teammates on the shoulder that I was running along. They were there to shout encouragement and to ring our cow-bell. Even our Gnome, who we brought along for the ride, Jean Claude Damn Van was with them. It was so great to see them cheering me on as I passed by. When I pulled even I asked for a sip of water and being the first runner of the day, we clearly had not thought that part of the process out. No water on the side of the road. Our driver Brian, who had just run his first marathon in Austin on Sunday himself ran over to the Damn Van, grabbed his water bottle from the cup holder and was good enough to give me a couple of quick squirts. Just enough to wet my lips and keep on climbing. I finally reached the top of the route at 2,741 feet, which would be the highest point along the 200 mile race. It felt great to kick over the top and let my speed match my effort on the way down. Last .66 Miles – 6:41 pace. My time over the opening leg was 59:48, 6:54 min./mile, the third runner to reach the exchange area. Solid opening leg I thought as slapped the timing baton around Jenny’s wrist she ran off into the desert. The next few hours would be spent repeating the same routine. Drive to the exchange area and ready our next runner for their leg. Cheer in our teammate and watch the exchange. Speed ahead half-way through the route to encourage the runner on the course and offer water to them. Drive to the exchange area for the next hand off. Our team was able to quickly find our groove in this process with the sun dropping in the West. The race temperatures were just about perfect as we were able to run with the sun falling behind us showing off a tremendous sunset. 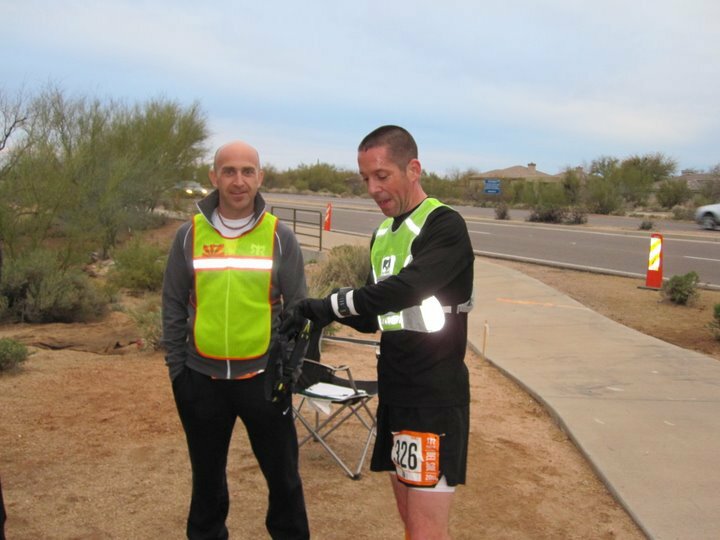 Once we completed our final van leg we picked up Thomas after he ran leg number 7 and sped ahead toward Surprise, AZ where I would be running leg #13 of the race after Van #2 ran their opening legs. We were able to find a Pei Wei for dinner and ducked in to enjoy our first real bathroom break in more than 7 hours, wash up and grab dinner. I opted for some Shrimp Lo Mein which honestly did not really sit too well with me – but nothing as bad as the Mongolian Beef that Jenny J. ordered for dinner. One smell of her leftovers a couple of hours later and we had to get that take-out box as far away from the “Damn Van” as possible. That thing was going to be smelly enough in another 18 hours, we didn’t have to help it along with Mongolian Beef. I had hoped to catch a quick nap before my next leg began, but I simply could not relax enough to doze off. After changing into clean running cloths, my reflective vest and headlamp we made our way over to the exchange point to take over for Van #2. Our handoff was not the smoothest and somehow I ran off with one of Nina’s gloves that fell to the ground, but quickly I had the legs moving again into the night. I’m not a night runner, and I thought that this would be my most difficult leg. I knew I would be out of my routine and my body would feel a bit out of sorts. The other thing I was fighting was a bit of soreness on the inside of my left knee. It started to bother me a bit on the opening leg, just some inflammation and irritation, but it was there for sure. I had run a lot of miles over the last few months and just completed a tough Austin Marathon course the previous Sunday. I expected some soreness and it had arrived. I just wanted to find a pace that felt “the best” and lock in to that pace. For the first time in a long time I was running next to another runner. Being a night leg with a few turns we chatted about the route and whether or not we really knew where we were going. He told me he wanted to just hang with me as two heads are better than one and I couldn’t disagree. We hovered right around 7:15 min./mile over the first warm-up mile, but my knee was barking at me. I told him I was going to search for something more comfortable and unfortunately he wasn’t able to hang with me after the 1.5 mile mark. I was alone again making the turn onto North Sunrise Boulevard heading off into the night. Just past mile 3 however I saw my teammates once again on the left. They had brought along water and Gatorade for me to choose from and a whole lot of wooting as I passed by. I grabbed a few quick tugs on the water bottle and sped down the road toward our next exchange point. I had told my friend Lara that I was looking forward to this leg prior to the race which was true. I knew it would more than likely be a very peaceful part of the night for me and I could reflect on Dom and on the Austin Marathon. Without really knowing it my pace quickened over the course of this leg and I found myself really pushing hard as I approached Jenny J. at the exchange point. Mile splits were: 7:14, 7:05, 6:51, 6:56, 6:50, 6:47, 6:27. My time over the second leg was 48:13, 6:54 min./mile once again, spot on with our opening leg. Jenny J. ran off into the night and wrapped up her leg just after Midnight. We had 5 more runners to go and we hopped right back into our routine. 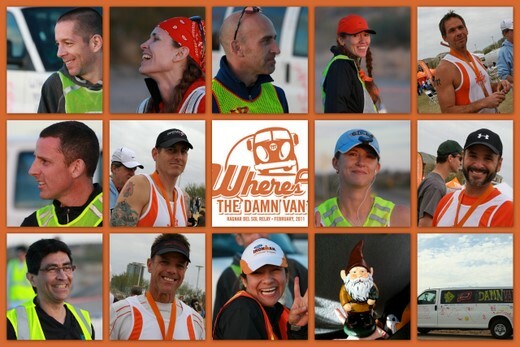 Due to an accident last year at Ragnar Del Sol on the course the race directors had decided that there would be no “van support” overnight. This means that we would not be able to pull off on the side of the road and cross back and forth offering water to the runners. 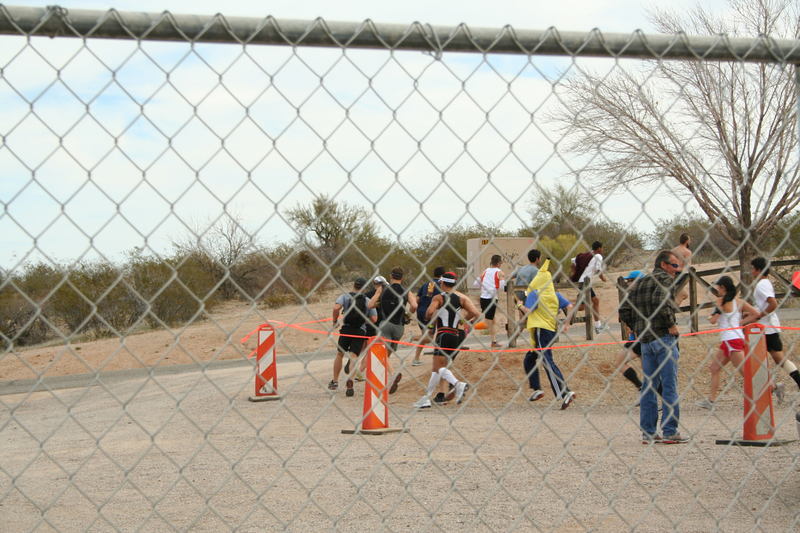 Great move from a safety standpoint, but it definitely made things a bit lonelier out there for the runners. Steve Ran a tremendous trail section of the course at blistering pace. Kimberly, Michael, Sean and Thomas turned in wonderful efforts and around 4:00 a.m. or so, Van #1 was back off of the clock. We drove on toward Cave Creek, AZ and the next exchange area in the wee hours of the morning. Perhaps this would be the time when I could catch a little sleep. I changed into fresh running clothes and ate one of the bagels that we had in the Damn Van. To this point since our ill-fated Pei-Wei decision, I had pretty much been going on Twizzler, Girl Scout Cookies and Snyder’s Honey Wheat Pretzels. Mix in a few bottles of Gatorade and you have the real breakfast of champions. We stopped at a gas station to fill up the Damn Van prior to my leg and I purchased a devils food doughnut for after my last leg. I thought it would be just the sugary reward to get me moving over the final miles. This run would again be an uphill run, but nothing like the first leg of the race. Only 3.58 miles in total distance, just a bit longer than a 5K. But I would have to climb 191 feet over the first 2.5 miles before a nice downhill finish for my Ragnar Del Sol miles. After this leg I chatted with Steve about how I had found my perfect rhythm for the leg almost immediately. This doesn’t happen very often for runners as it usually takes the better part of a half-mile for your breathing to settle in and the timing to get in sync with your stride and cadence. For whatever reason, perhaps it was due to the fact I had gone on three runs in less than 18 hours, I found my groove almost immediately. As I started to climb we at this point had caught up to a lot of teams that had started the Ragnar Del Sol race much earlier than we had. The race is designed so all teams regardless of their pace finish about the same time in the end. The first teams started as early as 7:00 a.m. on Friday. “Where’s the Damn Van? !” started at 1:00 p.m. with 16 other teams. The last teams started at 3:00 p.m.
As we reached the later exchange areas we came upon runners and teams we had yet to see, I passed 13 runners to the top of the hill at 2.5 miles, then pressed on to finish off the run. 7:16, 7:01, 6:26 and 6:06 pace over the final .58 miles. My time over my final leg was 24:17, 6:46 min./mile pace. I had saved my best running for last. Being the first runner on our team it also meant I was the first runner to finish. I climbed into the van with a big smile on my face and devoured my doughnut reward, chased by what must have been my 7th or 8th bottle of Gatorade. Runner after runner clicked off their final legs and after Thomas wrapped things up for our group around 10:45 a.m. we drove in to Tempe where van number two would wrap things up for team “Where’s the Damn Van?!”. We had just enough time to check into our hotel in Tempe, drop bags, change back into our team uniforms and head over to the finish. A walk around the grounds, a Cheeseburger, a brief relaxing stretch on a hill and more laughs about the miles we had covered over the past 24 hours. At just before 3:00 p.m. we saw Nina chugging down the homestretch to the finish. Our team hopped out onto the last 1/10 of a mile of the course and we all ran in together as the theme from the TV show Batman was blaring over the speakers. Normally I would be curious about the choice of music, but after no sleep for close to 33 hours at this point – I didn’t have the energy to ask anyone. Like the end of any race, finisher’s medals were distributed, photos taken and a lot of smiles and hugs exchanged. Team “Where’s the Damn Van? !” finished in 19th place overall out of the 306 teams to start and finish the event. 24 teams never made it to the start, 5 did not finish. Pretty darn good showing for our first effort at such a race. I have the feeling that “Where’s the Damn Van? 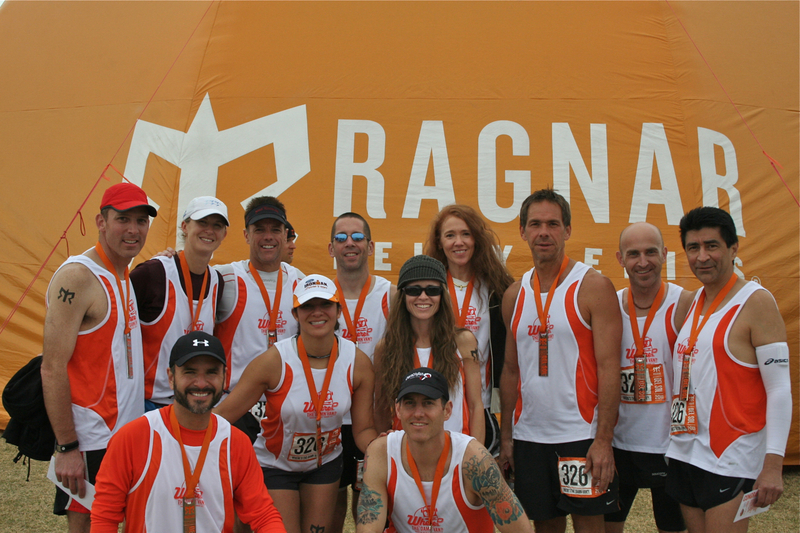 !” will be reassembling in the future for another Ragnar Race in 2012. Steve, Thomas, Jenny and Sean stayed in Tempe for the night as we had early flights out in the morning. Eddie from Van #2 made the trip with us to the Car Wash to have “The Damn Van” washed and all the paint removed. I could write another blog post about just this episode as I’m not sure the workers at the car wash knew what exactly to make of this paint covered smelly van that they needed to clean …. Pretty classic. We hit downtown Tempe for drinks, dinner and a little frozen yogurt and finally climbed into bed around 11 p.m. The first opportunity for sleep I had in the last 42 hours. For those of you who remember the movie My Cousin Vinnie – at 2:30 a.m. a freight train roared past our hotel blowing its air horn at maximum volume and we all were jarred out of our deep sleep. All I could muster was the word, “Seriously?” – which was met with tired chuckles from my roommates Sean, Steve and Thomas. A few hours later we were on airplanes flying back toward our hometowns, wives and kids. This week I am taking a full week away from running. I can’t remember the last time I had 7 days off consecutively. I think it will be good for me physically as I allow this knee issue to calm down a bit, but even more importantly I need a little break from training from a mental standpoint. We are only 2 months into 2011 and already I’ve run a half-marathon, full marathon and a relay ultra marathon with two large 10K races on the schedule at the end of March. It’s time. I need a chance to reload a bit, recover some and get my mind back into training. I am going to enjoy my downtime, reflect on some great running and racing and start evaluating what I need to do to improve. I had a great opportunity to chat with some great runners this week, download a lot of information and chat with my good friend Steve about his approach to running. I have some ideas about what my spring and summer workouts will be like leading up to training for the NYC Marathon in November. I am going to ratchet things up a notch once again just as I did last year at this time and get ready to run my best ever marathon. I know I have a great race in me. One that once and for all will show me exactly the type of marathoner that I can be. I caught a tough break with the weather at Austin last Sunday. That’s just the way it goes sometimes. But there will be another race day for me, another crack at that 3 hour marathon. So start spreading the news – NY, NY. – Maybe that will be the day on November 6th. Steve Speirs – by clicking HERE. Sean Brown – by clicking HERE. SPIbelt™ Giveaway on Joe Runs for Dom! To help celebrate our birthday at Run for Dom this week, I thought that it would be appropriate for me to give back a little something to all of you who visit the blog on a regular basis. I wanted to thank all of you who have supported our journey in honoring Dom and his battle with cancer, providing me with the gift of motivation, inspiration and support as I try to make even the smallest of differences in the lives of Val, Sierra and Nico. Helping ensure that Dom and Val’s children will have the opportunity to pursue an education just as their Mom and Dad had always hoped and planned for them. I wanted to have a giveaway that captured in some way the spirit of what Run for Dom is all about. I wanted it to be “real”, I wanted it to be “Austin” and I wanted it to be something that would “go places”. I wanted to give something that the recipient would be able to make theirs and take with them on journeys, much like I am able to take Dom along with me anywhere, anytime. Thanks to the great folks at Overton Enterprises, LLC – I am able to have a great, great giveaway today of one of their SPIbelts™. 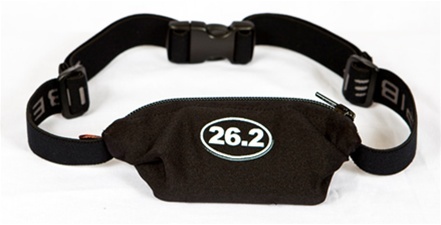 The SPIbelt™, an Austin original, is a tremendous product for runners and non-runners alike. SPIbelt™ the original Small Personal Item Belt – was the creation of Kim Overton, who while out on a run one fall day with her house key tucked in her sports top thought “There has to be a better way!”. That story resonated with me as a runner who shortly after learning about the serious nature of Dom’s illness had the idea of Run for Dom pop into my head on a training run along Brushy Creek Trail here in Austin. Almost four years later and the SPIbelt™ is seen at just about any race expo, race course and even running trail that I frequent throughout the year. The SPIbelt™ is sleek, expandable and can hold any iPod, Blackberry, Cell phone, car keys, Gu packs, Gels, Road ID or whatever items you need to take with you on your runs, rides or walks. It has a heavy-duty adjustable strap, fits snugly around any waist and best of all does not “bounce” as you get those legs churning. It’s pretty much ingenious to tell you the truth. The SPIbelt™ has evolved quite a bit since Kim sewed the first hundred or so by hand and now even comes in all kinds of designer colors. Everyone knows that it’s all about looking good out there. Just enter a comment into the comments area below, and tell me what post on Run for Dom this year was your favorite. The “Archives” can be visited by scrolling down a bit on the right had side of the toolbar just under the Calendar. On Wednesday (November 17th) I will use a random numeric generator to pick the winner and post their favorite story on the blog. You will be able to visit the SPIBelt™ website (here) to pick out your favorite SPIbelt™ to be shipped directly to you. Thank you for playing along and many thanks to our friends here in Austin at SPIbelt™ – you guys are the greatest! Good luck everyone and thanks for a great year at Run for Dom!